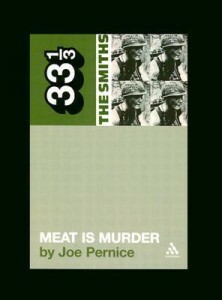 The Smiths’ Meat is Murder, Joe Pernice, Bloomsbury Academic, 2003, ISBN 978-0826414946, 110pp. I’ve been reading the Thirty-Three-and-a-Third series of books, which are like extended liner notes to albums for people who don’t think the originals had enough liner notes to begin with. So far, the series has been hit and miss. Didn’t care much for Dusty in Memphis, but the book about Love’s Forever Changes and the Kink’s The Kinks Are the Village Green Preservation Society really helped me have an appreciation for those two albums. Unfortunately, Joe Pernice’s book on The Smiths’ album, Meat is Murder, is a miss…as far as helping you understand or appreciate the album more. For one thing, as he writes in an author’s note underneath the acknowledgements, “If you think of the 33 1/3 series of books as a kind of extended family…then my book is the black sheep: it’s fiction.” It’s more than likely fiction of the “write about what you know” type, too, as it purports to be a memoir of Pernice (or the narrator, if you will) and his discovery of the album. I generally despise this kind of memoir, fictional or not, as I read enough of the white-suburban-my-childhood-really-sucked genre when I was going to graduate school in creative writing. Sorry, but if you want to read about a horrible childhood, read Frank McCourt’s Angela’s Ashes; privileged white kids who think Morrissey speaks to them because he feels their pain just sound whiny. But halfway through the story (which, although is presented as a standalone book here, is more of a novella or novelette), I started to kind of like the narrator, asthma and all. I didn’t necessarily sympathize with him, but I did start to cheer for him and hope that he was going to be able to achieve the little victories: be able to ask the girl for a date, form the band, survive another school day. And just when I thought the book was going get somewhere, it ended. Which is another problem with the stories I read in graduate school: no sense of completion. So I don’t recommend this book for Smiths fans or would-be learners regarding their album, and I hesitate to suggest it on its own as fiction either. Thankfully it was short.